09.00 and unable to see the fairway………….. It was goodbye to Dave Rollett as he finished his year as captain, whilst Kevin Smith also moved aside for Dave to take over the role of president. Dave Lloyd takes over as captain from May 1st, and we all wish him a successful year. 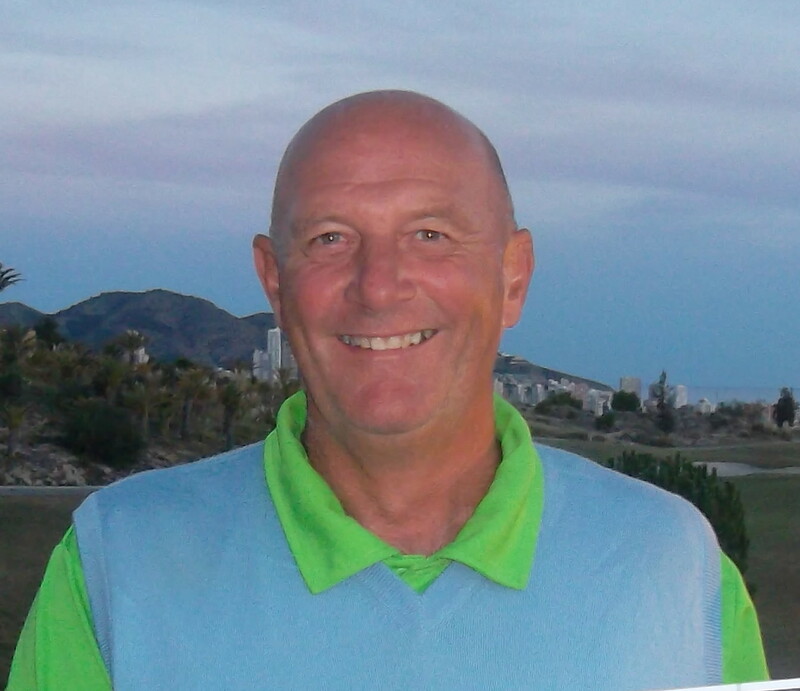 our new captain, Dave Lloyd………………. It came as a shock when we arrived to see thick fog suddenly appear, but the delay was only about 20 minutes, and the sun soon made an appearance. There were 50 players with 12 teams in the competition. Sandy, Torild and Andrew win………..
Jim Alwell holes his par putt on 16………..
Astri Spieler played a super round……..
Next week is the May Apollo Air individual stableford, and our annual charity day for the Seve Trophy follows on May 8th. Chris Page (Bakao) has offered to sponsor the competition and will supply all the prizes. For one day only the entry fee will be 3€ and all of that goes to the charity, along with a sum from the society, and an evening raffle. This will go to Edale mountain rescue in Derbyshire, who hope to raise sufficient funds to build a garage for their 4 * 4 rescue vehicle. This will also be a memorial to Steven Rollett, the son of our captain and secretary Dave and Barbara, who sadly lost his life in the French Alps in January. We will welcome any donations for prizes in the raffle, which will mean there will be more in the kitty for the charity. Please contact Alicia at events@cdagolf.com or Kevin at kevin@cdagolf.com if you can contribute. In fact, if you are going home before the 8th why not buy some raffle tickets in advance? Below is the post from a couple of weeks ago……………………. On May 8th we hold our annual charity event, the Seve Trophy. Over the last 4 years we have raised money for several worthwhile causes. 2011 was the Lorca disaster, 2012 the Seve charity, 2013 and 2014 went to our own on site CPR, and this year the recipient will be the Edale mountain rescue team. 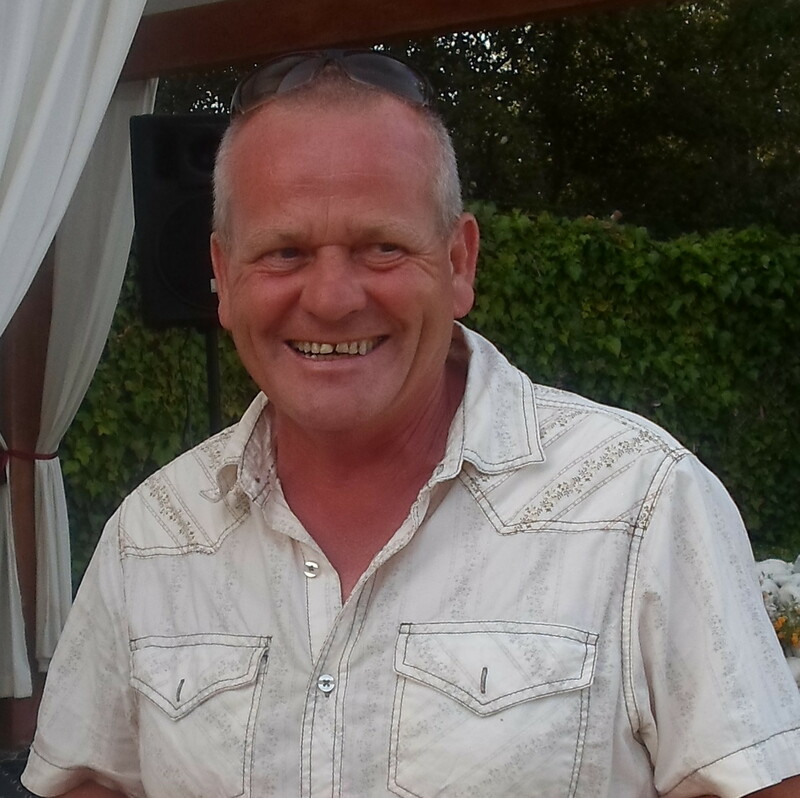 Our captain, Dave Rollett and his wife Barbara suffered a terrible tragedy when their son Steven was lost whilst snowboarding in the French Alps. The rescue service in France is not funded by a charity, so Steven’s parents would like to help the rescue services in their own area where their son spent much of his leisure time mountain biking, etc. You can donate online with Justgiving. Just follow the link and you can make a donation instantly. Alternatively, if you’re holding a sponsored event why not build your own page to allow your supporters to donate direct to Edale Mountain Rescue Team. If you want to donate in this way please quote ‘ Steven Rollett’. plenty of red & white in the bar on St Georges day…………..
A lovely start to today, (the actual St George’s Day), but yesterday (the competition day) started with an early shower and threatening clouds. By the time the players finished though, it was hot and sunny. We had 50 players, of which 45 were in the competition. Again scoring proved difficult, with Torild Lailey and Ken Saunders tying for first place on 36pts. and after a card countback Torild was declared the champion. Thanks to Lynda from Trophy Box, who sponsored the competition and gave out the prizes. super-fit Ken is in form at the moment…………. winner of the guest prize was Liam…………..
it was Kev’s birthday. ……. but no prize for him……. Not much to write about this week, so here are a few pictures…………………. on the 9th Barry Answer’s tee went further than his drive………..
he does dry out well though, being an amphibian…………..
at least he found his ball on the 10th!……………. 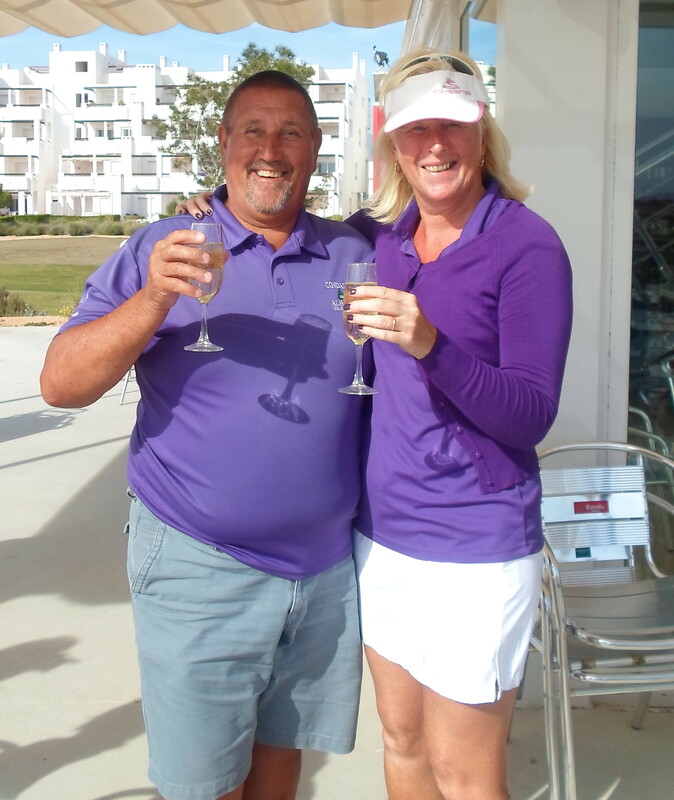 who said that the pairs strokeplay was a mickey mouse competition?……….. It was a good night in the clover bar, with entertainment from Martin Ross (formerly of the Beagles). Martin Ross got the crowd going…….. Tomorrow is the captain’s farewell……..(Dave Rollett) and will be a 1,2,3 waltz (4 person team). Friday’s competition was the popular format of texas scramble, where everyone feels they have played well at the end of the game! 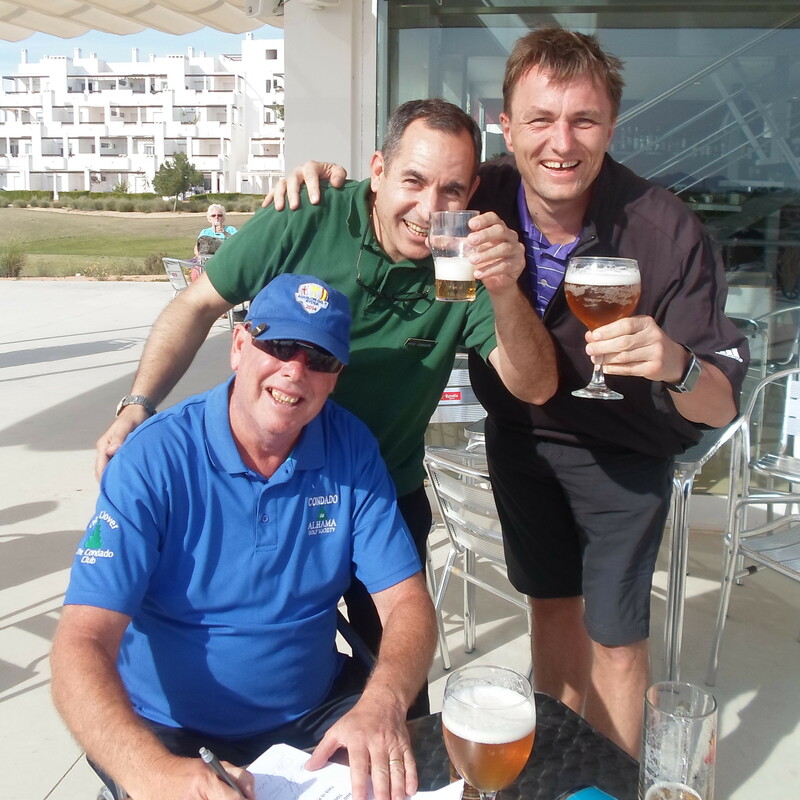 With 10% of the teams slope handicap being deducted from the gross score the winning scores are usually close, but not on this occasion – the winning score of 54.2 equates to a gross birdie EVERY hole! A gross total of 59 strokes (including 12 birdies and an eagle) and the nett of 54.2 is a record for a scramble with the society – well played to the team! With 52 players forming 13 teams there were 3 prizes. they must have thought a net 57 would be good enough…………. The wind did not get up until later in the round, although it did not really affect the scores. the flag hanging loose, and Tim Beisiegel about to finish off his drive and approach to 9 for an eagle………..
this par 3 is crazy!………….. I witnessed an interesting altercation on the 17th tee………… 2 women were wandering past the tee when one of our players politely explained to them that the should not be on the course as they might get hit by a ball. They replied ‘ you should shout fore’. I think that summed up their knowledge of golf, as the said they lived on site and were entitled to walk round the golf course. Maybe they thought it was a park owned by the residents. They said there were no notices to say that they were not allowed on the course (see photograph below for evidence that this is not true). They proceeded to be cantankerous, asking for the names so they could report the players. Our members told them where to go (the clubhouse of course!) where they did indeed make a complaint. Hopefully the staff in the shop told them in no uncertain terms what their rights were. It is a pity that the course marshall did not notice them taking their stroll. Next Wednesday is the St George’s day individual stableford, and it looks like another full sheet. If you can, wear red and white to make it a colourful spectacular. The presentation will be at 8pm in the Clover bar, immediately followed by the entertainment (Martin Ross). Friday is the captain’s farewell, which will be a team 1,2,3 waltz. With deadline day gone, the team for UK & Ireland has been finalised. The team is as follows. The match is being played on October 20th and pairings will be announced at a meeting in the Clover the previous night, October 19th. A couple of photos of recent winners…………………..
Peter Mitchell with his Apollo Air trophy for last week…….. If anyone is willing to give up their time to help on the Monday or Wednesday qualifying competitions please contact a committee member. The cards need to be handed out, also entry money and membership fees needs to be collected in the morning. After golf the scorecards need to be checked, prizes handed out and the cards need delivering to a committee member for keying. Q: Why doesn’t matter how often a married man changes his job? 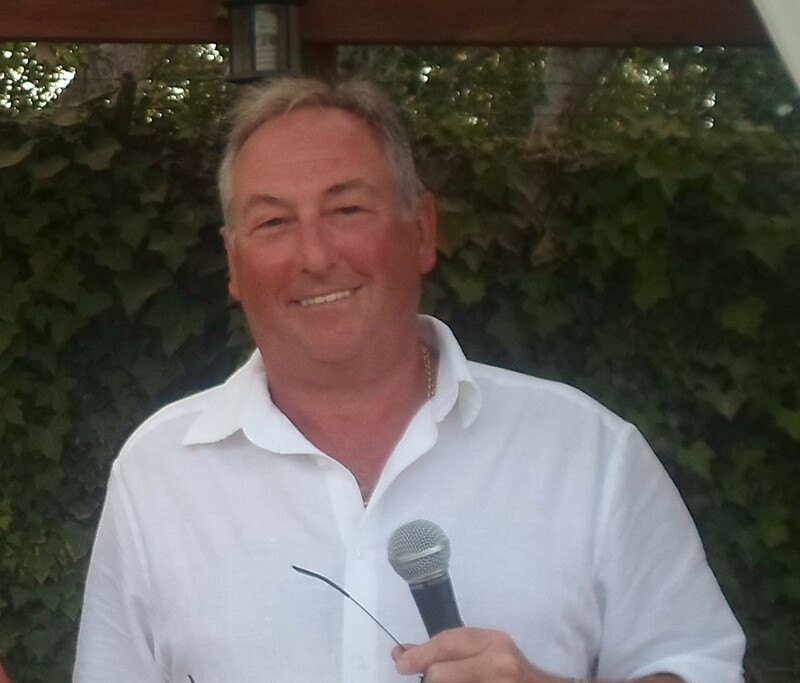 .Peter is like a fine wine…..he gets better with age………………..
More hot weather for the 60 golfers, who needed sunscreen to ward off the blistering rays (this morning, Saturday, it is raining and cloudy!). It seemed perfect conditions for golf, but again, only two players managed to beat par. It was unusual to find that the winners of the overall, 1st division and 2nd division had a combined age of 216 – Peter Mitchell 76, Fred Twomey 72, and myself, the youngster, at a mere 68. So there is still hope for those of you who feel like packing up and throwing your bag and clubs in the lake. Fred is still a very competitive golfer………. couldn’t take my own photo so Graham stood in again (as cameraman this time)……………..
Hilary won the ladies, had a two, and got a prize in the raffle!……. 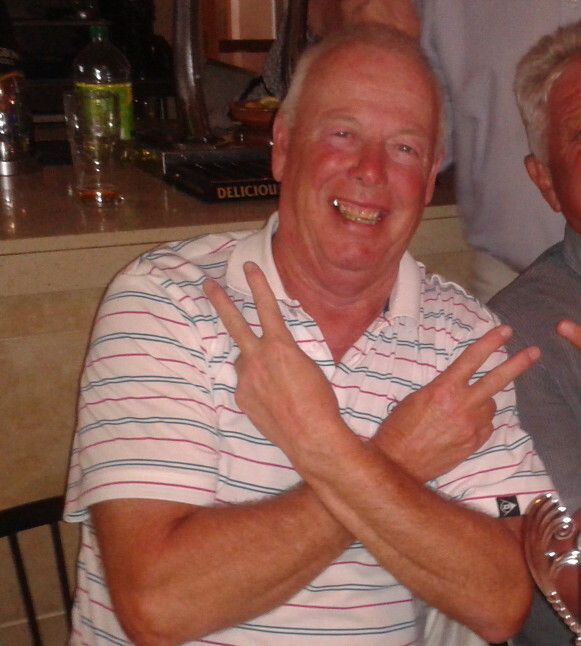 Graham collected Peter Mitchell’s trophy for him……..
no, Fred has not been shot – just his afternoon siesta………..
John Donaldson was unlucky with this plugged lie on 16……..
On a lighter note, we have all ages join us in the bar, even if they aren’t golfers! Terry…. you may not have much on top to keep the sun off, but stealing your granddaughter’s bonnet? Did you see the Grand National on television this weekend? The reward for the winner was to have buckets of water thrown over it, and a hosing down that seemed appropriate to riot police. Maybe we could have done the same to Gert last week in Trevis when he was celebrating his win! Seriously though, it was nice to see someone so proud to win one of our majors! Gert really enjoyed his success but perhaps needed cooling down!………. The midweek qualifying games have now begun, with handicap adjustments being made. This week we should mention a magnificent eagle achieved by Tim Beisegel. On the 18th he followed a fine drive with a short iron finding the bottom of the cup! Perhaps 2 under on a par 4 is better than one on a par 5 where maybe the green is reachable in 2 and a single putt is required. Next week is a 4 person texas scramble, and the sheet is again almost full. But especially as this is a team game please inform a committee member or email bookings@cdagolf.com if you are unable to play. The following Wednesday is the St George’s Day stableford. 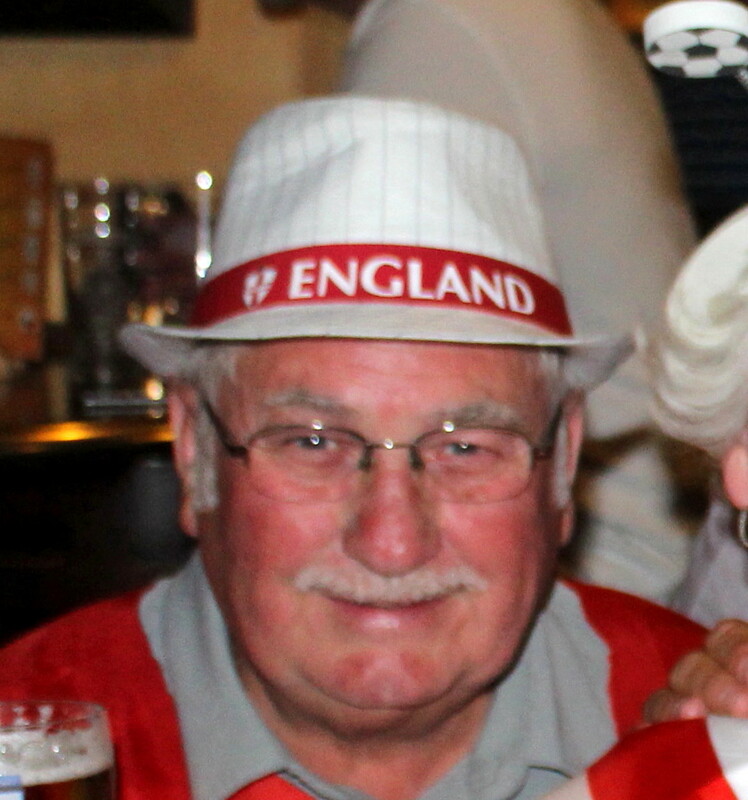 Although the actual day is on Thursday there are various reasons why we were unable to play on that day, although if you attend the presentation (7pm in the Clover) followed by an evening’s live entertainment, you may still be there at 12.01 when the actual St George’s day arrives! Ken signs an autograph for Jose the barman……..
just missed out but Les and Alicia can still celebrate………. Another nice day for the 83 players, 72 played in the pairs and another 11 in a singles stableford. This was a record for a single day (apart from the 2014 shotgun Viking Cup which included 92 players). It is becoming so popular that not only was the start sheet full on Friday, but next Monday and Wednesday are also full. So if you want to make sure of a time you can contact bookings@cdagolf.com (ideally up to 2 weeks in advance). 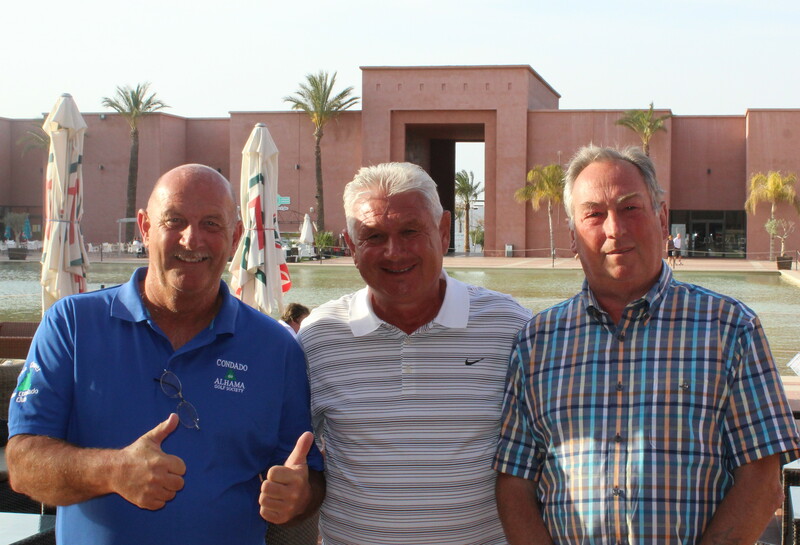 Some fantastic scores, but it was the early pairing of Gert Willumsen and Ken Saunders who held on, despite a late charge from Ken’s wife Alicia and partner Les Hurren (who were last out). Sorry, the photos of the presentation did not come out well with the sunshine streaming through the window spoiling them. But fortunately I got the winners and runners up outside the bar. Anne Ju Boifot tees off on 7……….. I played my shot of the day from a fairway bunker, but Chris had already sealed the deal………..
Kevin Smith attempted to play his ball out of the lake, and while the ball came out he uprooted a clump of seaweed which finished on his head! Very Neptune like! The presentation took place at Trevi’s bar on Camposol, with free transport provided from the social fund. Shani Ormston was the entertainment, and the dance floor was full. Ken is a bit of a ‘gangsta rapper’…………..
.Thanks to the committee who managed the event under very trying circumstances…………… Wednesday evening was a nightmare with the easter competition falling immediately following the start of the new society year. Apart from accepting late entries, we had to collect membership fees, verify handicaps on howdidido and golfbox (thanks Andrew), separate those qualified to play in the pairs from those not, and move pairs to fit in with buggy requirements. Friday morning Alicia (the starter) was collecting entry fees, memberships, checking handicaps, converting them from CONGU to the European slope system (all with a smile!). Also a late withdrawal (get well soon Malcolm) meant emails were flying around at midnight on Thursday. So be aware what goes into making your golf day seem so simple! As mentioned earlier the start sheets for next week are already full, but some players do not understand we have no more times, and have added their names below the allotted times. These have already been booked by others with the staff in the shop. Also if buggies are required you must arrange that directly with the shop on 0034 968328008. There is a good offer for twilight and weekend golf at Camposol. While there is still plenty of work to be done to get the course in great condition (the bunkers still require a lot of attention), it is much improved and is good value. Best score (strokeplay not stableford) to count at each hole.